Aren't these little bags so cute? 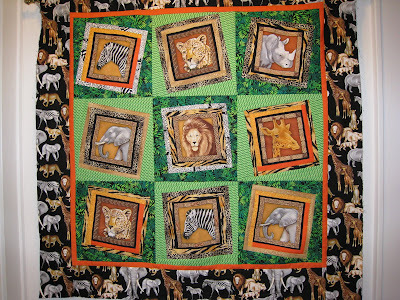 Each square is only 1 1/2 inches finished. I made 15 of them to give as gift during the holidays to my beloved mini bee friends. After making 3 of them exactly as the direction stated, I experimented. 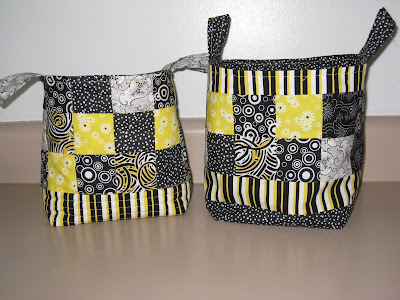 Now I have cute bags that are larger, quilted and embellished with a food safety removable lining. I'm going use them to carry my holiday banana bread to my "special" neighbors and friends. to show off the new fabric at the quilt store. It turned out pretty cute and I love the bold colors. 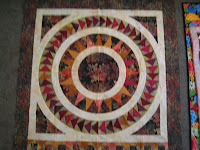 I took a paper piecing class by McMeeking. 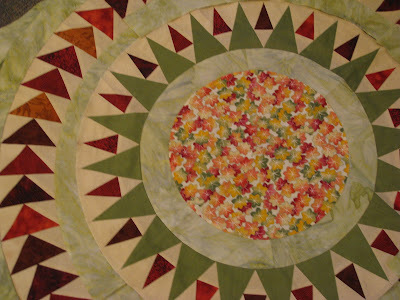 Her quilts represent the tiled floors in Italy. Aren't they beautiful? 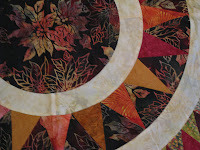 I love to paper piece and really hope I can finish this quilt sometime in my lifetime! 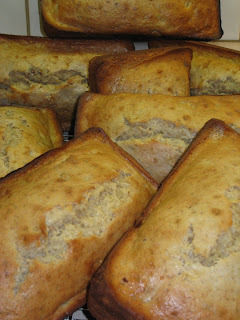 DO YOU LOVE BANANA BREAD? My family loves my Banana Bread. baskets I'm making for gifts. like to try it. Tell me what you think. Add all ingredients in large bowl. DO NOT over mix. Mix until all ingredients are moistened. Use your spatula to scrap down bowl after a minute of mixing on medium speed. Oil and flour your bread pans. Hint: I spray my pans with bakers spray and then put a lining of wax paper on the bottom and spray again. You wont have any bread sticking with this technic. 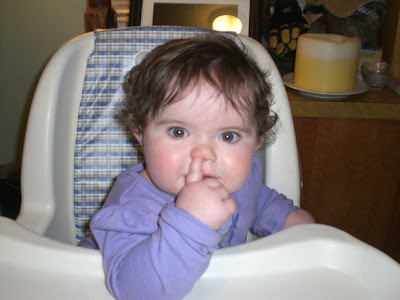 Rylan has found the joy of picking her nose! And as any good grandma would say "Isnt she the cutest?" What happened to the light show? I was really looking forward to observing the bits of debris from Halley's Comet interact with Earth's atmosphere. The Orionid display was supposed to be most intense between 1 a.m. (Wednesday morning actually) and 6 a.m. We went out side at midnight (maybe Halley will come early?) and I cant see a thing. The sky is overcast in Chicagoland. We were up at 4:30am and ITS RAINING. I missed the great experience because of clouds. Well, I guess I will have to wait for the next time Halley's Comet breaks up for us to witness. I only have to be patient for 76 years!